Super-Team Family proudly presents Firestorm and The Vision in “Overkill”! Be sure to check out Ross’ work on Super-Team Family: The Lost Issues! There are some really impressive gems in there! My thanks to Little Russell Burbage from Portsmouth, Washington for the heads-up on this awesome team-up! Posted in: Comic books, Firestorm #01: Original (Ronnie/Martin), George Perez. Now if only Firestorm would take out white costume Vision. Then he’d be doing us all a favor. Super-Team Family: The Lost Issues is brilliant stuff! And thanks to you Shag (and Rob) I’ve discovered this and begun posting the Blue Beetle related one’s over at my blog! 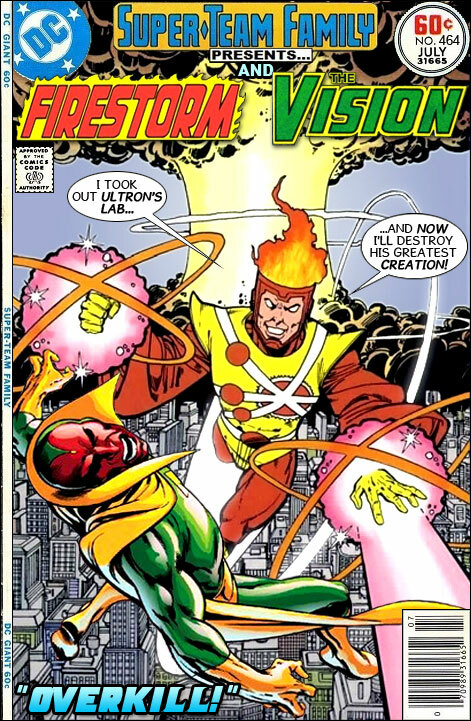 Could Firestorm’s transmutative powers impact Vision if Vizh was intangible? Obviously Vizh would still have a molecular makeup, but if those molecules have no effective mass, is there anything to transmute? If Vision pulled his “solidify my hand inside of your chest” trick on Firestorm, what would the effect be? Splitting Ronnie and the Professor apart?